Hyrum Smith, co-founder of FranklinCovey and seller of thousands of Palm Pilots, was asked in 2009 about technology and planning. This is what was said. 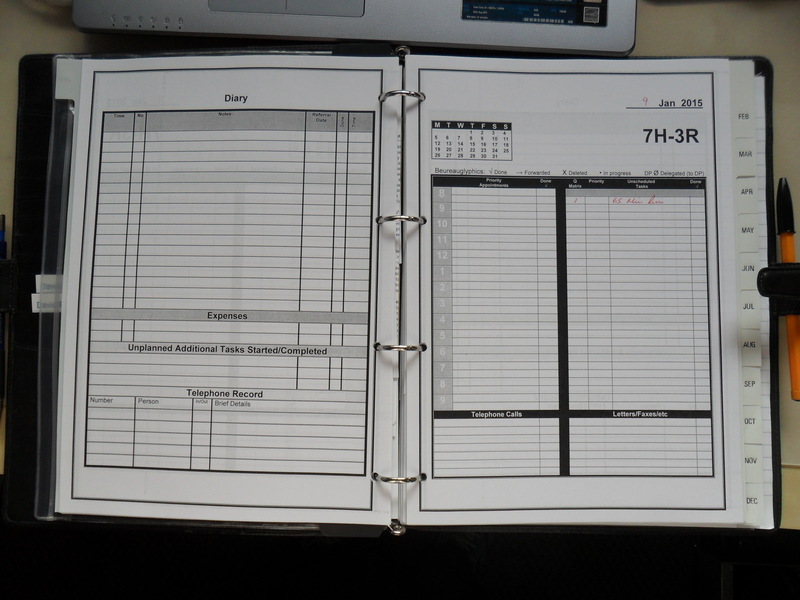 Q; Technology today offers many electronic options for managing time, but I still love my paper Franklin Planner. Are we seeing a return to paper and pencil, or is the trend going toward electronic tools? I put away my paper planner for 13 months. I went to a PDA and I discovered that I could do everything in my Palm Pilot that I could do in my paper planner, but I wouldn’t. The reason I wouldn’t is because it took too much time. It was too hard to do. I came back to my paper planner because of the ease of the operation. 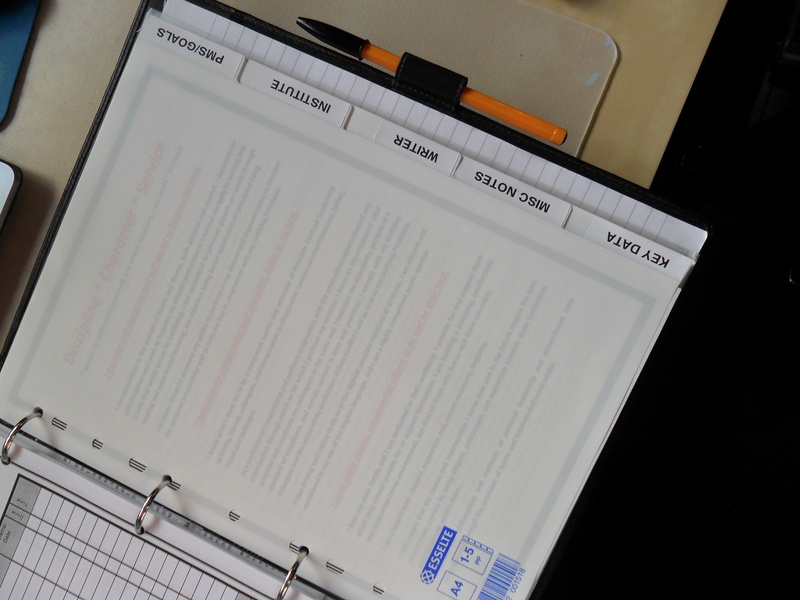 What I discovered was that for managing tasks, appointments, and taking notes, a paper planner is four times faster than any electronic device. There is a whole host of reasons for that, but I will just leave it at that level. A paper planner for tasks, appointments— managing me—is four times faster. Now, there is a place for technology. I carry a BlackBerry. I love my BlackBerry. What do I use it for? I can communicate my calendar to my people. I can download The Wall Street Journal. I can check my email. It is a wonderful phone. But for managing me in the heat of the day, my paper planner is more effective and it is faster. I have had letters from CEOs, senior vice-presidents from all over the country, telling me, “Hyrum, I’m back to my paper planner. I’ve got control back in my life.” In fact, just a year ago, a senior VP from Merrill Lynch went through our seminar. She said, “Hyrum, you trained me 18 years ago, I went to an electronic device 3 years ago, I lost control of my life. I went back to my paper planner and my control is back.” There is something about writing on paper that a human being likes. I’ve spent a few hours pondering about using my smartphone for planning, but I can’t get around the size of the keyboard, the fiddliness of the note-taking facilities, the constant spell checking by me or machine, the fact that the phone will be gone at the end of a contract along with all that I record on it (no, you never really take the time to transfer it all), and the poor way the diary/task management software works in reality. Not to mention the fact that for all that tech provides, all smartphone users are still carrying around heaps of paper anyway. If the leadership of companies like Merrill Lynch think papers I best, who am I to argue? HAPPY STEPHEN COVEY’S BIRTHDAY DAY TO ALL! Begin with the End in Mind – ALL the Time. ≈ Comments Off on Begin with the End in Mind – ALL the Time. In the book First Things First, Stephen Covey wrote about how we should begin our lives with our legacy in mind, and he went further by writing in this (mainly but not exclusively) time management book that we should plan each week with the same objective – a plan that we would execute during the week to ensure that by the end of that week we had achieved what we’d set out to do. Stated within those pages but not as clearly to me as he had intended – my fault, not his – was the idea that Begin(ning) with the End in Mind applied to everything we do, not just life-, work- or daily-plans, but even the most routine stuff. This was brought home to me last week when I went for a long run and limped home afterwards because I had neglected to consider the condition of my feet, specifically a ruddy great toenail that decided towards the end of my run to incise the adjacent toe and cause a rush of blood into my sock. I consider this concept to be the reason why I love using my personal planning system. It does look nice and it is exceptionally convenient to use, but the most practical benefit for me is that when I put something down in it, whether it be a task or an appointment, I am immediately pushed to thinking about what preparation is needed for that item. If it’s an appointment, what paperwork will I need, what travel plans are necessary (maps, then satnav – always! ), what else can I be doing while I am travelling/waiting/in the area, etc. If it’s a task there are similar considerations, like have I got the tools/equipment/skills/money that I need and, if not, where can I get it and what else can I get/do while I’m collecting it. (That’s a skill developed after a day where I visited a hardware store 5 times in one day – that’s another story.) If the plan involves other people I can look towards deciding what they can or could bring to the party, what their needs are and what I can do about them. The final, practical benefit of a paper planning system is that when these thoughts arise I am already sat in front of the very thing I need to make the plans and plan the actions that have arisen just out of the one, original intention. Of course you can do all that on a tablet, although the jumping between programmes can be a nightmare for the slightly less e-inclined. Since everything we do has an objective (or we shouldn’t be doing it – what is the objective for watching soap operas? ), then everything we do has an End in Mind towards which we should plan, and in respect of which we should execute that plan. Many generals have said “Planning is everything, but plans are nothing”, reflecting the older adage, “No plan survives initial contact with the enemy”, but their point is always – planning is a necessary and fundamental part of success. Once you know the End I Mind you can change the plan. But if you don’t know the End, or you don’t have a Plan, you haven’t started yet. The only sad part about getting good at this? Is that you get so good that you don’t notice you’re doing it. Consider obtaining some sort of planning system – electronic or paper, it’s up to you and you don’t have to take my absolutely true, effective and unarguable word that paper is better. Take your time and really consider investing in a quality system (Daytimer, Daytimer UK, Franklin Covey or FranklinCovey UK, TimeSystem US or UK, or Filofax, the bigger you can manage, the better) Then learn how to best use it in your own situation, and commit to doing so for at least 31 days. By which time you’ll probably be a lot better at doing what you want to do, when it needs to be done, and at the level of execution excellence you seek. Which is the end you have in mind, surely? For some reason running has been feeling harder but the times are sound. This suggests that I am running faster at first, so getting puffed out, then slowing down to reach the distance in the same time. Logical, but does it mean I’m hitting my maximum speed? I hope not because it means that no matter how far I run I’ll run at 8 and a bit mph! Which means a sub-2 hour half marathon if/when I get there, but never any better. I’ve focused a lot of attention on spreading the word via social media (like this site, Facebook, and Twitter – @3resolutionsguy). I’ve also started readying myself for some more goals, because after I lose weight and assuming I stay where I get I will have to have something more to focus on. Like a new job…….. Living your values, it is generally accepted in the personal development field, is the best way to ensure high personal self-esteem and life-long happiness. Charles Hobbs (TimePower) and Hyrum Smith (FranklinCovey) both specifically address how living in accordance with your highest universal principles – your own set of genuine, conscience driven rules and standards – is the best way to feel successful, because it is intrinsic (part of you) and no dependant on outside approval, social acceptance or material wealth. Living your values means serenity and peace. And violating them brings anxiety, guilt and even depression. How do I know this? From experience, that’s how. A couple of days ago I was merrily driving along, using the correct driving principles as taught to me by skilled police drivers, and adhering to the speed limit when a chap drove up behind me so close I couldn’t see his headlights. Considering we were in a 30mph limited road which was on the approach to a roundabout this seemed a bit silly, but I didn’t bite. I just raised my hand in a circle, separated the finger and thumb, and indicated thereby that perhaps the driver may consider pulling back a tad. He did so, and I gave him the thumbs up. Just as he accelerated hard and overtook so that he was still on the wrong side of the road as we came to the bollard at the roundabout entrance. Now, if I had been proactive and used the stimulus/response gap to think ‘he’s a nutter so I’ll give him space’, things would have been fine. However, in that instant, I chose the ‘oh, we’ll see who can get to the gap first then, shall we?’ reactive technique. As it was, there was just enough – by inches – space so that no collisions occurred and I was able to add a verbal description of the driver through our mutually open car windows before we went I our separate directions. And for the rest of the day I felt really off. I felt off because I had failed to act in accordance with my unifying principle ‘I demonstrate high levels of skill and patience in driving.’ I felt off because I had not considered that circumstances like this lead to potential confrontation and while I am not fearful of ‘it’, confrontation is such an open ended activity. If I win the immediate confrontation I have no guarantee that it stops when it is over, especially these days when violence and revenge and utter stupidity seem to be the watchword of people whose first response is reactive thuggery, rather than being dragged slowly towards that end. Would I find that he would torch my car, find out where I live and threaten my kinfolk? If there had been a rumble, even if I had won what could the legal consequences have been? Was I prepared for them, did I want or need such inconvenience? And if the road hadn’t been wide enough, was I prepared to spend money and time repairing my car because I was reactively miffed? Over the remainder of the day (and my reaction still irked me at bedtime) it occurred to me that, occasionally, it is not the highest ideals that we find hard to live up to, but the tiny ones. Say we choose to study, and do so diligently towards a professional qualification. It’s hard, but it’s doable. At the same time we resolve to be patient, and then someone jumps into the front of a queue and we go nuts. In many ways the patience objective is the easiest – easy to understand, easy to see ourselves doing it, easy to define – but the stimulus to challenge it can be too sudden and we have no time to think (correction, we do not take the time to think) and so we fail. It’s a lesson we should all consider to be valuable. We have failed, so next time we won’t. It’s a demonstration that we are compliant with both the First and Second Resolutions. We discipline ourselves to be patient, deny ourselves the counterfeit sense of righteousness that the offending behaviour can engender within us, and our character shines through (with some competence in patientology). Next time – just drive off ahead of the tailgater, or let him go. Let him offend and endanger someone else – I am too important to me and to my family and friends to suffer because of my own ego. Only two pounds lost this week but the running programme continues apace (see what I did there?). This weight loss means (if it continues at 2lbs per week) I may miss my 1/9/ target but as the months differ in lengths I anticipate that any slide back will be compensated for by 1/10/14. The diet remains easy to comply with, too.